We are two days out from the end of the school year, and the order forms for supplies for NEXT year have just been sent off. Are you ready to start thinking about the next school year yet? One thing is for sure... we all want to make a good impression on the teachers! And how can we do that? Well, bribe them with gifts of course! 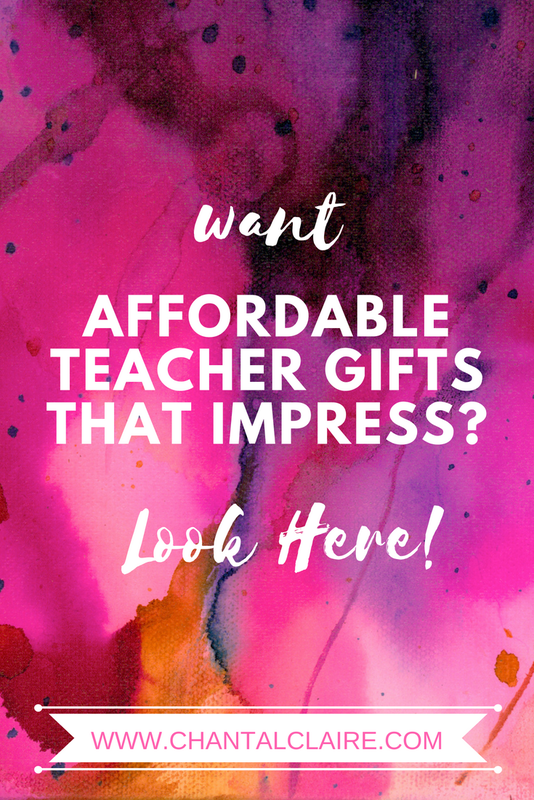 What Gift To Buy For A Teacher That's Affordable? Do these sound familiar to you? I know I've been guilty of buying the chocolates once or twice early on! But not you. Oh no, you want to stand out. You want to start your year off right and make that teacher realize that you and your kid are aces above everybody else. You wanna impress with a gift that looks like a million bucks. I have had the joy to have quite a few educators within my social circle. Over and over again, they have told me that for a gift they would like something a little different. Well hey. I am the queen of being "a little different." I personally am a huge fan of anything homemade, and always encourage my children to make their teachers a present. But since every family is different and not everyone has the time, patience or resources (or can stand to have glitter and paint covering every surface of their kitchen *ahem* studio), please allow me to offer some alternatives. Who doesn't love a unique piece of art? It is an unexpected gift and you can usually find prints on etsy for a really great price. Artwork made with alcohol ink, shown above, is especially on trend right now. I offer prints starting at $14.99 for an 8x10, which is less than a fancy coffee mug! Since art can be so subjective, if you don't know the person well I suggest going with something smaller than larger. An 8x10 is a good size because it is easy to display, especially in a classroom, in a tabletop frame. I would also suggest sticking to a more neutral color palette. My original pieces Chocolate Dream, Sandstorm I and Sandstorm II fall into this category and have been very popular as gifts. Other places to check out, if you are looking for something more generic, are Walmart, Target or Home Goods. Although remember your goal. Generic may not be the way to go here. Oh man, is it a rule that every teacher needs to go through 1200 notecards a year? Do your kids bring home a lot of handwritten notes from their teachers? For every gift their teacher receives, my kids bring home a handwritten note on a card and I swear I should have bought stock in Hallmark years ago. A great teacher gift would be to replenish her stock. You can find unique notecards at any craft fair, artisan market, etsy or of course here. And the best part is that by purchasing in these places, you are supporting a small creative business. If you choose my notecards, you can build your own package during the checkout process. If you have a favorite design, get six of just that design! Or if you need twelve cards and want a variety, choose that option. It's up to you! My card packs are made to order, starting at $9.99. I can't say "flair" without thinking of Jennifer Anniston in Office Space, sticking her middle finger up and saying, "Here's your flair!" Is your teacher a fashionista? Do you know her well enough to buy her something a touch more personal? Then maybe some artisan earrings are the way to go. These earrings were created using a macro of my art prints, but there are lots of unique pieces of jewelry on etsy. If you like this idea, check it out! I charge $14.99 per pair, I know the price varies on etsy depending on the materials used. I have hesitated to write this part, and to be honest am writing this two days after I initially posted. I hesitate because I don't want to devalue other artisan's hard work, but a friend encouraged me to point this out... some of the earrings you might find on etsy are created using the paint drippings from fluid art. Without going into details, I know how these paintings are created and wouldn't put those chemicals that close to my face where I might breathe them in. My earrings are created using paper prints cut to size and glued under a glass cauchabon. I'm sure there is nothing to be concerned about with the other earrings, and I feel like a bit of a jerk saying something, but at the behest of my friend I am pointing this out so you can make your own call. I hope you have some new ideas for your teachers! They work really hard. And y'know, after having the kiddles home this summer, maybe you should treat yourself to some pretty things too. If your kids are anything like mine, you will have earned it!